This photo is actually several weeks old – taken at the Niobrara Valley Preserve right after the big wildfires had blown through. On this particular evening, I was crossing a bridge over the river and saw a photographer working to capture the evening light coming through the spray of a waterfall. I had just enough time to squeeze off a couple shots of him before he started packing up his tripod to leave. 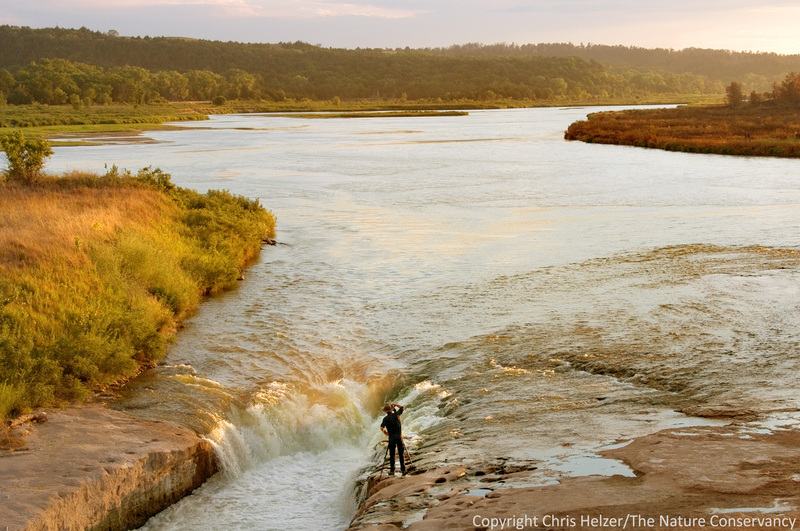 A photographer catching the evening light through the waterfall just upstream of the Norden Bridge – The Nature Conservancy’s Niobrara Valley Preserve. Click on the photo to see a larger, sharper version. When I took this picture, I was covered in soot from working all day in recently-burned areas. The photographer, the beautiful light, and the clean water passing over the falls were all in stark and welcome contrast to most of the surrounding landscape, which consisted largely of scorched earth and trees. The scene was like a small peephole into what the larger landscape had been like just a few days earlier. I’ve delayed posting this photo because I wasn’t sure whether I liked it because of my emotions at the time or because it was really a quality photo. To be honest, I’m still not sure, but it’s time to post it anyway. I hope you enjoy it. This entry was posted in Prairie Photography and tagged nature photo, niobrara river, niobrara valley preserve, outdoor photography, photographer, photography, waterfall by Chris Helzer. Bookmark the permalink. I really like this photo, thanks for sharing! Excellent image, I really like it. I’m not always sure what people mean by artistic merit, but it IS a beautiful photograph! Reminds me of the tons of biomass in an unburnt prairie. I believe you are the professional here. Good job. Well, it does show there are waterfalls in Nebraska! The presence of the photographer is important to show scale. And how we’re all looking out across some distance for a wonderful sight. I love that photo, Chris! No need to be hesitant about sharing it. It’s got a very special energy and combination of elements, and I wouldn’t even attempt to describe how they combine to create magic. while I understand your feelings after spending time in the burn zone, it is an awesome photo and story well told. Beautiful photo Chris! My favorite time of day and light! Glad you shared it! Gorgeous photo! And melmannphoto is right: Seeing the photographer helps understand the scale — I wouldn’t have thought the waterfall was that big (it IS Nebraska afterall!) without the teeny man to demonstrate. Besides, at this point in the drought here in Oklahoma, where it seems like our entire state is burning, seeing ANY water is refreshing! I love that photo! Good job. Thank you for sharing. Chris, I have eyed that slit in the river every time we go up to the preserve, have photographed it a few times and you are the man. Great shot and as has been said the human scale helps. Do you have any pictures that closely show the contrast from one side of the river or a stream with burn on one side and green on the other? Or, just where the fire was stopped? Taking pictures at that exact same location, over a period of weeks, months or even years would probably be very interesting. Thanks Mark – We’re talking about setting up some time-lapse photography to do just what you’re saying. I agree – it’d be very interesting.